PTMSC Blog : My First Teaching Adventure! I am standing beneath the prickly branches of a pine tree near the Natural History Exhibit as the rain comes down. I gaze up at the hoard of squealing children tromping down the hill to meet me and I wonder, “What have I gotten myself into?” I am excited, but my enthusiasm is interlaced with nervous fear. Can I really teach 50 rowdy 5th graders? Yes I can, I tell myself as the first soggy kid reaches me and says, “I’m taller than you.” And so begins my very first teaching adventure at PTMSC. Thankfully, standing beside me is Heather Jones, AmeriCorps alumni turned professional youth educator, who will be splitting the teaching load with me. Once all have gathered under the prickly pine tree, we introduce ourselves and break the group in half, one class follows at the heels of Heather, the other class swarms me. The name of this particular eduction program is called Whales of the Salish Sea, or WOSS for short. It consists of eight marine science classes and spans over three days. Here’s a peak at what we do during these three glorious days! 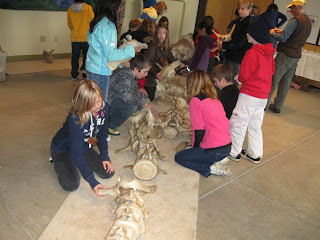 We make observations about marine mammal skulls! This one is a harbor seal, notice the sharp teeth for holding slippery fish. We become orcas and have to find our pod by using signature calls. After learning about the diferent kinds of whales and talking about the life hisorty of gray whales, we put together Sprit, the young gray whale! We become orca detectives and try to solve the mytery of Hope's death. Everyone grabs a microscope and examines plankton- the base of the marine pyramid! We hold a Town Hall meeting and vote on tidal turbines. ﻿﻿I am proud to say that my first teaching adventure was a success! We only broke one thing! All jokes aside, it was a truly fun and rewarding experience. These kids are our future. The health of the planet will one day be at their mercy, as it is at ours now. Perhaps the best thing we can do for our planet is to encourage our children to cherish nature, to love our oceans, and to play outside. Because once you love something, you want to protect it. I am glad to know that you’ve enjoyed your first teaching adventure. Sometimes I wish I can be a teacher because it looks fun to teach kids.